Many residents of Limburg speak Limburgish, a group of dialects that are also spoken in the areas of Belgium and Germany that border the southern province. 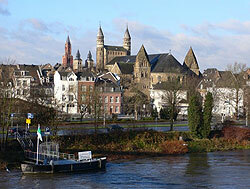 Limburg’s capital, Maastricht, became the Netherlands’ first industrial city when glass and ceramics manufacturers opened shop there in the mid-19th century. Today, manufacturers of medical equipment and electronic data systems are just some of the companies that have branches or headquarters in the city. Maastricht is best known as the place where the European Community treaty was signed to form the European Union and create the Euro. The southern part of Limburg is hilly. One of these hills is the Vaalserberg, the highest point in the Netherlands and the point where the corners of three countries (the Netherlands, Germany and Belgium) meet. The river Meuse winds through the province from one end to the other. On either side of it are old towns, nature parks with substantial forests and old caves, and fields and meadows. The countryside is dotted with mills and windmills, castles and estates. In towns such as Hasselt are found museums that preserve historical artefacts of the region.